This morning I awoke early with a sense of expectancy in my heart. It was like an overwhelming hunger for something more than I have seen or heard. As I walked downstairs in the silence of my home, my family rested sound asleep. Despite the silence, however, I could hear in such a magnified way, the sounds around me. It was as though I had been awakened….truly awakened. My senses were heightened and my hunger insatiable. With that thought in mind, today, I begin blogging again with the heart to set the record straight. Why do I do what I do? It is because I KNOW my life is a gift from God and what I do with it will be my gift of gratitude back to Him. I seek to do the IMPOSSIBLE, because I believe that if what you seek to do has already been done then you are living in the shadow of other men. But if you brave to go to uncharted territories, then you must have faith in what is unknown, unseen, and follow a voice that is BIGGER than you, WISER than you, and ABLE to fight battles that you may otherwise, coward away from. Today, I sit here at 3:54 a.m. praying for YOU. If you are reading this, then somehow, you are near me, whether by internet or by location. If you are with me, you, too, are being called to a place of heightened awareness. It is time to wake up. I mean REALLY wake up! I urge you to remember the reason you decided to do what you do. Is merely for personal gain? If so, then you will be distracted by the things around you that are elementary and temporary. If you are fighting for a cause that is BIGGER than you, then you will keep that image of that goal indelibly before you, knowing that momentary pain may result in the long-term gain of others. No great leader has EVER accomplished greatness with ease, simplicity or pain-free existence. Instead, their lives, their businesses, and their accomplishments were forged on the anvil of adversity, where their leadership was seen, not by the days of ease and luxury, but instead, their greatest days were illuminated by the backdrop of adversity that created a storybook of victory over defeat. Again remembering my grandfather, I remember learning about the story of David and Goliath. David, a mere shepherd boy, walked directly into the line of opposition, surrounded by arrogant Philistines and cowardly Israelites. Seeing the BIGGNESS of the opposition and the weakness of his own people, DAVID woke up, not just physically, but something on the inside said, “I was born for such a time as this.” His senses were heightened and his faith secure that day he chose to take on the BIG GUYS. 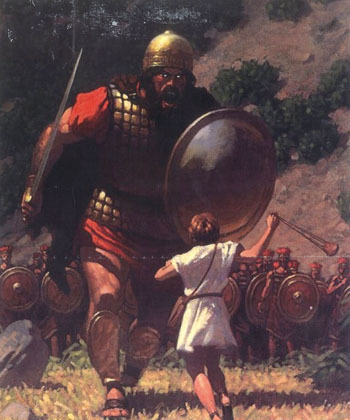 While others backed away in fear at the mere size of Goliath, David saw nothing but the result such a victory could bring for His people. While the Israelite soldiers, backed away in fear, frustration, and fatigue, David rose to the challenge of his opposition. He knew in his heart that it was HIS TIME and that field of war was HIS PLACE. More importantly, seeing that others were unwilling to fight the battle, he knew he was THE ONE to take the big guys down. He wasn’t trained in much, but he did know 3 things. One…he could protect sheep and he could protect people. Seeing God’s people in a weakened state, even though they claimed to be warriors, David understood his role to protect and provide. Two…David had already killed a lion and a bear in his past, so he knew how to fight the big guys with more than physical strength, for David was a worshiper, backed by a powerful God. And three….David knew his skills. Picking up 5 smooth stones, he pulled out his slingshot with ABSOLUTE CERTAINTY and verbally declared war on the Philistines, followed by ACTION that resulted in victory. The prize? David was given leadership, love, financial increase, respect, and his own measure of rule that would one day make him king. Isn’t it about time you, too, wake up to realize that the battle you are fighting, though big and daunting, very well, may be the battle you are called to fight that will lead you to your greatest place of victory? NOW is your time. THIS is your place. And YOU are the one to boldy go where others fear of going and doing the IMPOSSIBLE. As you approach today, take courage in knowing that your past has prepared you for this season of life. You were born for such a time as this. You have experienced much to equip you to be the leader and voice of hope to the world around you. I challenge you today to rise to the challenge of your adversary and use everything you’ve got to boldly go where others fear of going. That was something I needed to read. With everything I’ve gone through in the past year…I’ve almost decided to give up. Although I know deep down inside I never will…but this has given me new hope, cause, direction and energy to do what I feel God has called me to do! Thank you so much for the words of encouragement when I needed them most!!! Excellent post. I was inspired! Hi Staci, your wise and insightful words have hit a nerve in my spirit. I just read this today for the first time even though you posted it nearly 5 years ago, but God’s timing is perfect. I just returned from a mission trip to Guatemala where our team served at a safe haven for girls that have been rescued from terrible abuse called the Oasis. The theme at the Oasis is Taking on the Giants with God’s power. These girls overcome the giants of their abusers and the broken lives resulting from their pasts. They have a new identity in Christ and have been healed and set free by Him! As I come home to my own world, I realize that I have my own giants that I need to stand against. One of which is a new business that I am starting called Corporate Chess. I am not a business person and the task before me seems very daunting, but this is God’s business and I’m trusting that He will give my family victory and success. Needless to say, I love the picture you chose to illustrate Slaying your Giants 🙂 Thank you for your encouraging words! !